In general, such a device will be a small information gathering and delivering node, transferring the data via GSM/GPRS (or UMTS/LTE) to another services node. Examples are Smartmeters, measuring the actual power consumption or Telematic Units delivering measuring statistical and location data to its supplier. Most of these devices communicate either via SMS or via mobile data (GPRS/UMTS/LTE), and that is why we need a test environment supporting access to these layers. Once having access to the layers, it is possible to perform typical attacks such as scanning, eavesdropping, data interception or message spoofing and follow your common penetration testing steps. Having a look at the market, there are not many choices for equipment; you can spent a lot of money for a BTS or the core elements, but you usually will never get access to the underlying code. That is why we finally decided to use SysmoBTS in combination with OpenBSC and OpenGGSN. All of them are Open Source, but supported by a strong community (it is maintained and more or less stable). The reason why we’ve chosen SysmoBTS/OsmoBTS instead of OpenBTS is the requirement to be compliant with the standards. Some of you might already know the setup from Troopers GSM network which is quite similar. The SysmoBTS itself covers the BTS part and is working quite out of the box, we only have to configure the OML address in the local configuration. All other information is pushed by the OpenBSC via the Abis interface. This includes MCC, MNC, the used Frequency, and encryption capabilities. All other processes necessary for pentesting (such as authentication and access to SMS/mobile data) is handled by OpenBSC as central management authority. Finally, you have to start a local UDP listener (e.g. via Netcat) on the pentesters laptop and forward the traffic to your pcap file. 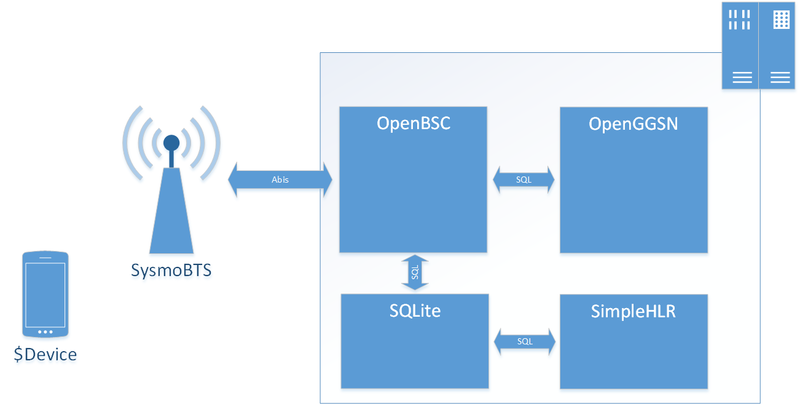 The authentication in our setup is done by the OpenBSC in combination with the integrated HLR. The HLR is implemented as a SQLite database allowing easy access to all necessary information. We also can touch the database in runtime via command line or additional applications. We are using a modified version of SimpleHLR. This tool enables us to add or modify subscribers on the fly via web application, and it provides functions for sending and accessing SMS or other services (e.g. Paging) in our network. For pentesting of a device the best authentication option is to accept all connections trying to authentication against our network. Unfortunately this could often result in an accidently IMSI catch of your mates closeby :-). You have to use this option anyhow if you don’t have Ki/Kc of the tested device (e.g. via using an own SIM card). Finally, to access mobile data traffic we have to enable GPRS on BSC and configure OpenGGSN to route the traffic to a certain network. This includes the PDU of the SMS, which is saved in cleartext in the text column and the 7-bit encoding data (or 8 bit, depends on configuration) in the user_data. Also interesting might be the src_addr and dst_addr if you want to test message spoofing. Not all command SMS should be accepted from every peer, right? In some cases of pentesting you also will see OTA and no “normal” messages. You can identify those via the protocol_id and the used data_coding_scheme (usually they are transmitted via 8-bit binary data). If you want send SMS you can simply add a message to the SMS table. I think this is be enough for a first explanation of our setup. It enables us to bring our pentesting methodology to devices using GSM/GPRS as interface. Feel free to play around with and I am always happy to hear your feedback.